It's the little things that are different - the ledges round the edge of tabletops. The vacumn toilets. The oval window. 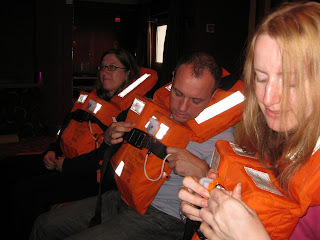 Oh yes, being on a cruise ship is similar in a lot of ways to a feature-rich hotel, but you know that you're just one stormy night and an iceberg away from bobbing around wearing a fetching orange floatation vest. Of course, this being the Med, the is little chance of 'bergs (as we seasoned cruisers call them). We have had torrential rain, thunder and lightning though - on the first afternoon. We've also explored the ship, toured the ladies changing rooms, hit the buffet and found the only decent coffee place. The gym is strange. The cardio machines are arranged looking out of a panoramic window, towards the direction of travel. The area for floor work doubles as the nightclub dancefloor in the evenings, and the whole area is surrounded by comfy seating - so all the pervs and oldies can watch people getting sweaty. Chris is down there now, entertaining the old ladies. More later - boat sinking drill due in 15 minutes. I hope that they can refloat it afterwards.